Aluminum reflectors and trim. The light source can be concealed with sandblasted safety glass- leaving the reflector exposed or you can choose the opal methacrylate screen to provide a luminouse facade. 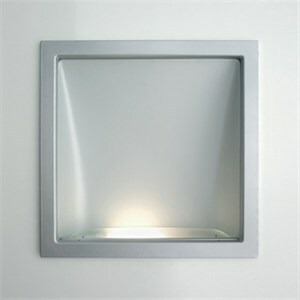 Dimension 13.25"H X 11.4"W X 3.3"D; Recessed hole size 11.4" Square. Uses 1 X 13W GX23-2 compact fluorescent (not included), 120V magnetic ballast.